CHESTNUT HILL, Mass. - Boston College scored four times in the first 11 minutes of the middle period and defeated the University of New Brunswick, 6-0, in an exhibition competition before 1,734 fans at Kelley Rink on Saturday. All four Boston College forward lines scored at least once in the contest, 14 skaters registered at least a point and three goaltenders - Parker Milner, Brian Billett and Brad Barone - each played a period and combined to stop 18 shots to register the team shutout. Junior Bill Arnold, junior Patrick Brown and senior Brooks Dyroff recorded multiple-point nights, while freshman defenseman Colin Sullivan led all skaters with a +5 rating. Sophomore Johnny Gaudreau opened the scoring with the only goal of the opening period in the ninth minute. Sophomore Destry Straight doubled the hosts lead in the third minute of the middle stanza before Arnold, Dyroff and Brown scored one goal each in a span of just one minute, 43 seconds halfway through the second period. Arnold scored from the slot on the power play at 8:48, Dyroff scored from the doorstep at 9:51 and Brown blasted home a one-timer from the slot at 10:31 to conclude the scoring burst. Sophomore Danny Linell netted the lone goal of the third period - at 17:32 - for the 6-0 final. 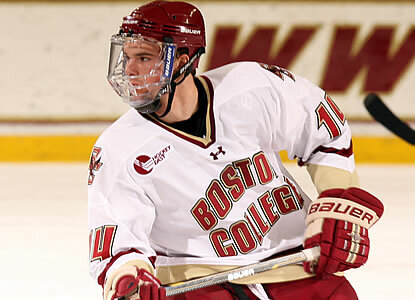 Boston College outshot the visiting Varsity Reds, 34-18. The Eagles scored four times on 17 second-period shots. New Brunswick's Travis Fullerton stopped 21 shots in 40 minutes in the losing effort. Daniel Lacosta stopped seven shots in the game's final 20 minutes. Next, Boston College will travel to Northeastern for the 2012-13 season opener on Saturday, Oct. 13 at 7 p.m.
Exhibition notes: The teams were meeting for the first time since January 2009 when the Eagles traveled to Frederick, New Brunswick for a two-game exhibition series ... BC finished 1-for-6 on the power play.